NTIA leads the Administration�s efforts to promote the use of broadband services in the United States. Consistent with the President�s goal of ubiquitous access, NTIA formulates and advances public policies to ensure that all Americans have access to broadband services at affordable rates. Broadband services enable the Internet to serve as the platform for innovation, economic growth, and social communication. Broadband has also helped the Internet become the backbone of a global digital infrastructure that is an integral part of the information economy domestically and abroad. NTIA supports policies fostering the rapid deployment and adoption of broadband services. These policies include: doubling the available spectrum for wireless broadband services to 500 megahertz within a decade beginning with an analysis of federal spectrum bands suitable for such services; reforming universal service to include broadband services; facilitating competition among broadband service providers; engaging in ongoing research on broadband Internet adoption; developing and publishing a nationwide interactive broadband map; administering and evaluating the Broadband Technology Opportunities Program (BTOP); and addressing online privacy protection. 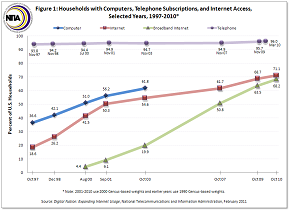 NTIA supports its policy work by compiling Internet and Computer Use Studies and Data Files. NTIA also plays a crucial role in implementing the Federal Communications Commission�s National Broadband Plan. Finally, NTIA�s broadband work advances President Obama�s National Wireless Initiative to provide high-speed wireless coverage to 98% of the nation, deploy an interoperable public safety network for first responders, and support the research and development of new wireless technologies and applications. Broadband Technology Opportunities Program (BTOP): Funded at $4.3 billion, BTOP provides grants to support the deployment of broadband infrastructure in unserved and underserved areas, to enhance broadband capacity at public computer centers, and to encourage sustainable adoption of broadband service. Through this support, BTOP will also advance the Recovery Act�s objectives to spur job creation and stimulate long-term economic growth and opportunity. - The Census Bureau's October 2009 data file and survey instrument are posted at http://www.bls.census.gov/cps_ftp.html#cpssupps (scroll down to "CPS Supplement," specifically the October 2009 Internet and Computer Use Data File and Data Dictionary). 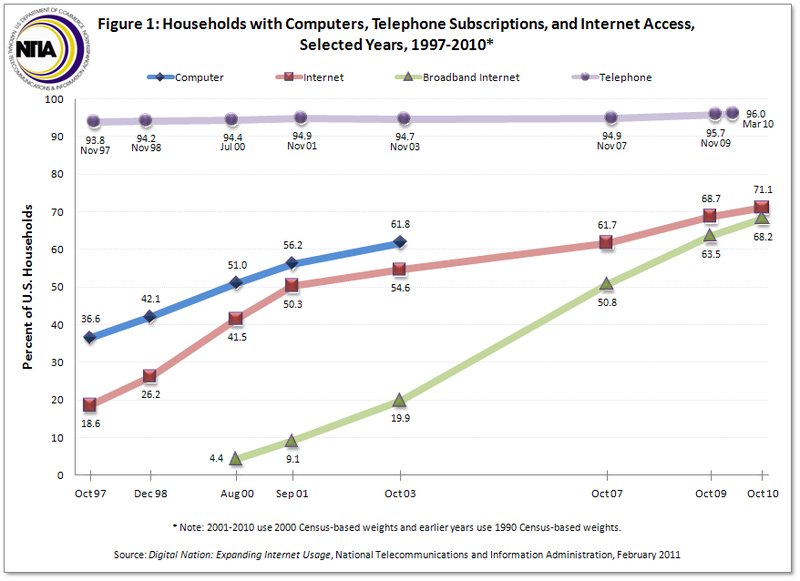 DIGITAL NATION: 21st Century America�s Progress Towards Universal Broadband Internet Access: NTIA's report on U.S. broadband Internet connectivity based on a survey of over 50,000 households commissioned by NTIA and conducted by the United States Census Bureau.